Quality components and sonics in a compact near field. Dear? Yes. But for critical monitoring in smaller rooms it’s a fine choice. Pretty compact given the 7” woofer size. Very powerful onboard EQ with handy preset system. Rear-mounted controls not particularly convenient. The S Series is Adam’s flagship monitor range and it’s recently received a major overhaul. For review we have the S2V, and this is the smallest in the range. It’s built around a newly developed 7” woofer with Adam’s latest S-ART ribbon handling tweeter duties. Onboard amplification is a combination of Class D (woofer) and Class A/B (tweeter) and the crossover, volume, time delay and EQ settings are handled by onboard DSP, accessed via a menu driven OLED on the back. Here you’ll also find an analogue input via XLR, a pair of AES3 digital connectors (you can daisy chain two monitors from one digital input), USB input (for use with the S-Control application), and an expansion slot for future options. As mentioned, both drivers are new or improved designs. The Extended Linear Excursion (ELE) woofer design uses a new Hexacone-based profile alongside a custom-designed Symmetrical Magnet Assembly (SMA), considerably improving the voice coil travel characteristics. Meanwhile, the tweeter includes a new waveguide milled from solid aluminium, improving the horizontal dispersion for a broad sweet spot. The decision to move away from physical front panel controls has not only made the S2V look less cluttered but has also allowed them to shrink the cabinet height and redesign the front facing bass ports. Overall, the S2V looks incredibly slick and compact. Setup is straightforward. All settings, including volume, source and delay (0ms to 5ms), are made via the menu-based OLED or via USB using the app. EQ settings reside in two factory and three user-editable presets. The factory options are flat (Pure) and subtly enhanced (UNR), while each user preset provides six fully parametric bands with additional high and low shelves (all +/-12dB). Powerful stuff. Adjustments can also be made using the S Control application (Windows and OS X), and presets can be saved to desktop as well as written back to the monitors - handy. Even so, the app uses a manual store-and-read system rather than real time plugin-style adjustment, and on balance we found it no simpler than reaching round the back. The S2V sounds mighty fine, and we were impressed by the broad sweet spot, even though the sweet spot is narrow vertically, so sitting height is important for mid-to-high frequency delivery. For me, though, the biggest surprise are the low/low-mid frequencies. These are incredibly well defined and you get an excellent sense of the frequency pockets, particularly when tackling bass sounds and the body of kicks and snares. What’s more, with a forward rather than rear-facing bass port, there’s less reason to reach for the EQ to resolve bass build up. Any gripes? First up, the rear panel LCD isn’t as convenient as front panel controls, and changes via USB are not instantaneous, like a plugin. Plus, it’d be nice to see a combined XLR and TRS jack for the analogue inputs. 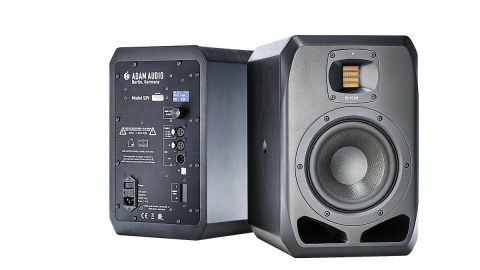 Nevertheless, these monitors sound fantastic and offer great customisation scope. That’s what you’re paying top dollar for.